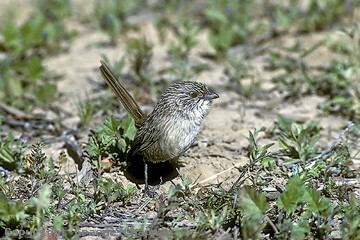 Thick-billed Grasswrens have recently been re-instated as a full species. 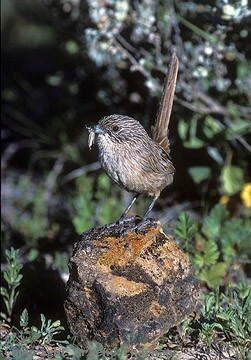 This shorter-tailed, paler eastern form has suffered a similar reduction in range as its western counterpart the Western Grasswren. The combined onslaught of rabbits, sheep, foxes, cats and now goats on its saltbush (shrub steppe) homelands has been dreadful, especially in times of drought. ( See pics 510209 and 510210 under Western Grasswren) Thick-bills once ranged widely across western NSW in saltbush country and then gradually disappeared. For a while they were considered to be extinct in NSW until the recent discovery of a small population NW of White Cliffs. In South Australia the known easterly limit at present is just N of Olary, about 100 km west of Broken Hill. Likewise in the north, they once ranged well into the N.T. up the valley of the Finke River - in fact the first nest ever found was right up near Palm Valley. In recent times, only the odd sighting has been made north of the S.A./N.T. border in the vicinity of Charlotte Waters, about 30 km S of New Crown homestead. Out in the chenopod shrublands, the denser growths of saltbush along the creeks and drainage lines are good places to look for Thick-bills. They occur in much the same places year after year and no doubt live as pairs in permanent territories. Their current stronghold appears to be the Lake Eyre Basin - they occur all along the Oodnadatta Track and even along the main highway south of Coober Pedy is a good area. 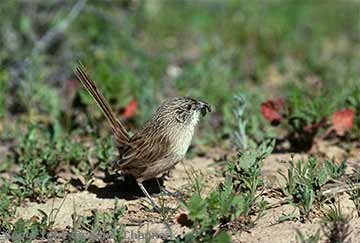 This species has the most high-pitched and feeble calls of all the grasswrens, very hard to hear in the wind and certainly not for the aurally challenged, like me these days! The male bird at Mt Lyndhurst did spend a few minutes or so on the nest, presumably brooding the small nestlings. When foraging, which he did mostly within a radius of 100 m or so, he spent a lot of time turning over small stones in search of food. 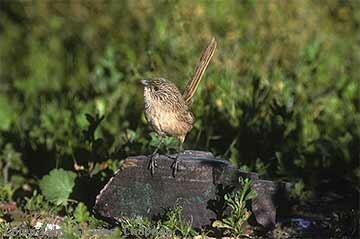 512204 ... Thick-billed Grasswren, Mt Lyndhurst, S.A.